WITH a twist of the wrist, a Thames Water engineer ended 18 months of frustration for the residents of South End Green on Saturday as their Victorian fountain began flowing again. 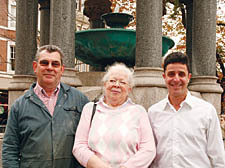 The tinkling of the waters marked the end of a long running campaign to get Camden Council and the water company to honour a promise that the fountain would flow again. Last year, work was completed on the green but the developers failed to make sure the fountain was working. For South End Green Association’s chairwoman Pam Gilby, the running water marked the end of a long, personal campaign. She said: “I was promised the water would be running by last February. I have had to make a call almost weekly to the Town Hall to get them to honour their promise. But Mrs Gilby’s battles to improve her neighbourhood have not finished with the spouting fountain. Sega has drawn up a wish-list of works, including a 20mph top speed limit. Other improvements include raising the road to the height of the pavement from Keats Grove down to Pond Street and replacing kerbs with bollards.